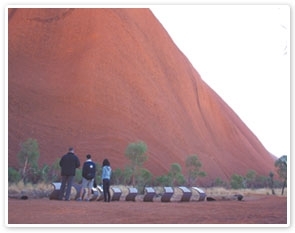 Today you’ll rise early and travel to Talinguru Nyakunytjaku – the Uluru Sunrise Viewing area. Simply translated, ‘Talinguru Nyakunytjaku’ means ‘to look from the sand dunes’. The platform offers an incredible view through the dunes and stunning desert landscape as the sun rises over Uluru and Kata Tjuta. Make your way on to the viewing platform to see many kilometres into the distance, providing an ideal photo opportunity. Once you’ve experienced the amazing sunrise over Uluru and enjoyed a relaxing morning tea, you’ll head towards the base of Uluru. Your experienced Driver Guide will join you on a tour around the base of Uluru and give you details on its geology and incredible history. You’ll be fascinated by the Aboriginal stories that go back many thousands of years. You’ll then head to the Mutitjulu Walk where your Driver Guide will lead you to the famous Mutitjulu Waterhole. The waterhole provides a key source of water for the Aboriginal people in the area and has been in use for many thousands of years. You’ll see wonderful Aboriginal rock paintings and come to understand their significance. The Uluru – Kata Tjuta Cultural Centre houses an amazing collection of original ceramics, paintings and punu (woodwork) that provide an insight into the unique and spiritual culture of the Anangu people, the traditional custodians of Uluru. You can watch the gifted crafts people as they create their works and take home your own unique piece of punu. Uluru is a sacred site for the Anangu people and they prefer that visitors do not climb it. With this in mind, we do not recommend it. The climb is a physically demanding activity that can take up to two hours. So, if you choose to do the climb, you will not be able to join the Uluru Base Tour, Mutitjulu Walk or visit to Uluru – Kata Tjuta Cultural Centre. Your Driver Guide will drop you at the climb start and return to collect you for the journey back to Ayers Rock Resort. Please understand that the climb may be closed without notice due to weather conditions or cultural observance.